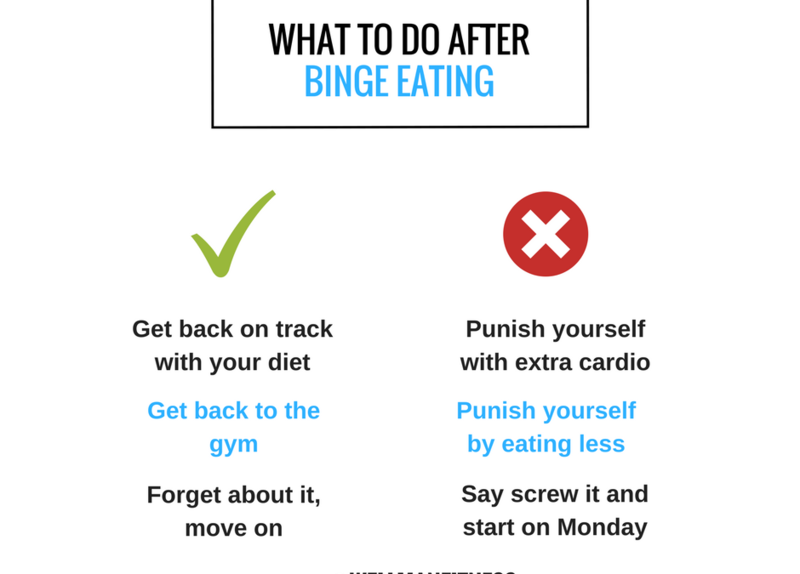 What to do after a binge eating? The weight loss journey is never smooth, there are always bumps along the way; just realising and accepting that will ensure you remain positive and make progress with your Weight Loss goals. How many times have you binged and then said “the diet starts Monday” instead of just accepting it, move forward and get back on track. Punishing yourself with going low calorie, Zero calories and spending hours on the treadmill will only create a poor relationship with food, yo yo dieting and body image issues. Remember, you cannot out train a bad diet. It’s not about being perfect with your diet, but creating good habits. For example, next time you have a binge, get back on track the next day with good nutrition and training.